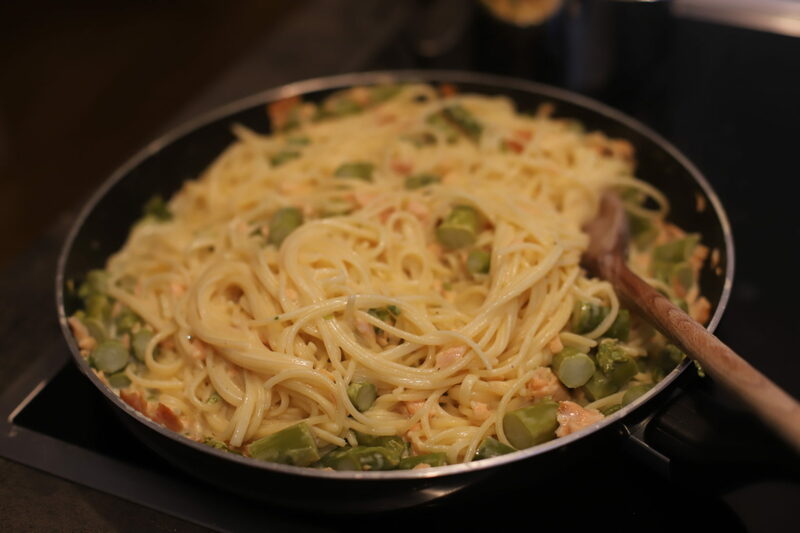 This recipe for salmon asparagus pasta with vodka was inspired by a recipe from one of my favorite cookbooks. The Silver Spoon is a masterpiece for Italian cuisine. With more than 2000 recipes and lots of beautiful photos it had kept me busy for quite a while. The Salmon Pasta is a recipe we come back to again and again, especially when our grocery store has an offer for smoked salmon. 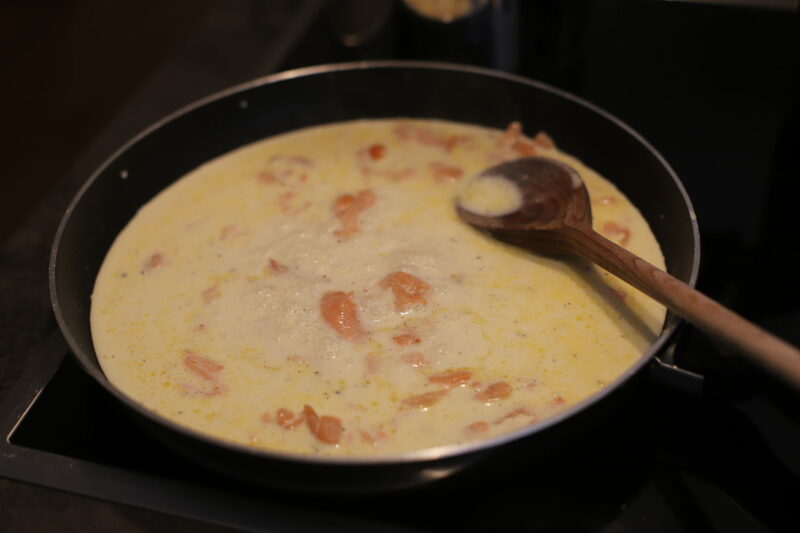 You can do no wrong with smoked salmon anyway, but the combination with creamy sauce and pasta just does it for me. But then, everything with pasta is great if you ask me. 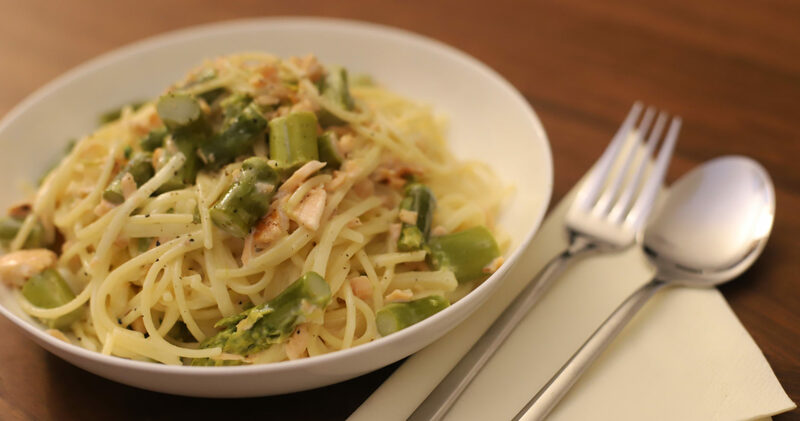 The Salmon Asparagus Pasta is a simple recipe in need of only a few ingredients, which makes it a favorite for after-work dinners. Or whenever Ali asks for “that creamy salmon sauce”. It took me a while to figure out what he meant by that. The Salmon Pasta in the silver spoon is a little different and we made it many times. We experimented with different ingredients and ratios to get the perfect combination. But then sometimes it’s just a question of what’s in the fridge and what else you have at hand. And sometimes it’s a combination of both. 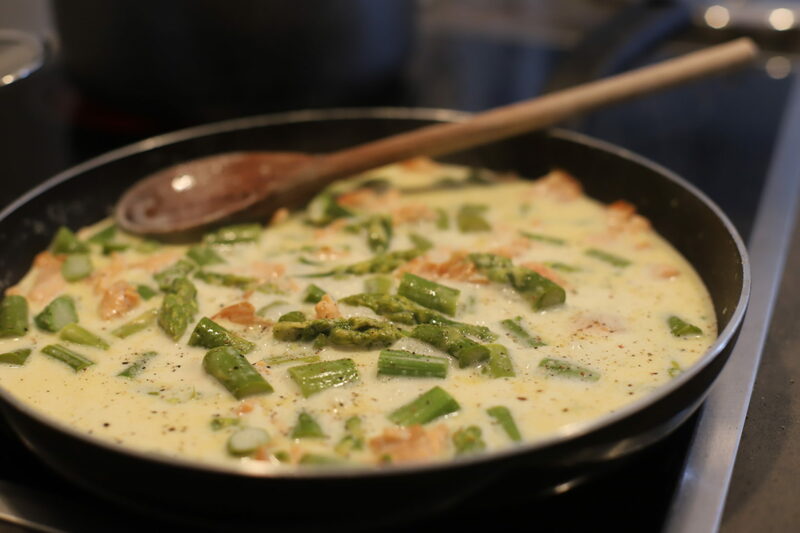 Asparagus is still in season, therefore as with the Asparagus Carbonara last week, we decided to give our favorite Salmon Pasta also an asparagus-twist. If you don’t have any at home or if they’re not in season, don’t despair. You can make this recipe without asparagus any time. The original recipe includes Whiskey and we’ve been doing it like that for many times. Last night we changed the Whiskey to Vodka for the first time and it was a great success. You can probably also make it with white wine, but we haven’t tried that one yet. That’s a recipe for another time. If you’re not into alcohol or have to avoid it for any reason you shouldn’t just skip it. In this recipe it’s a major carrier of flavor. Instead of Vodka and Whiskey, add some garlic and cheese. Keep in mind, it will change the taste significantly by having to substitute the alcoholic ingredient. This recipe is for 2-3 people, depending on the amount of pasta used. 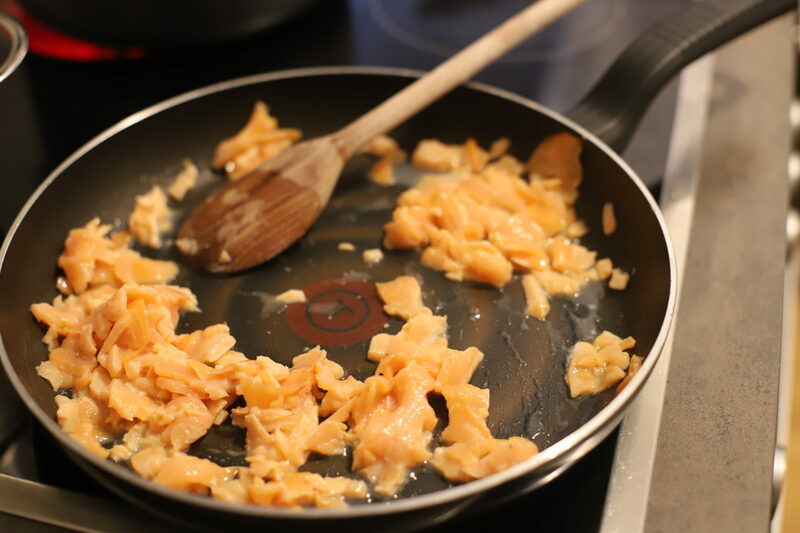 Heat the butter in a pan on medium heat and add the smoked smoked salmon. Stir the salmon for 2-3 minutes on medium heat. Add the lemon juice, some salt and pepper and stir some more. The pasta water is probably cooking by now, so add the pasta to the water. Add the heavy cream and the vodka to the sauce, let it cook for a few minutes. 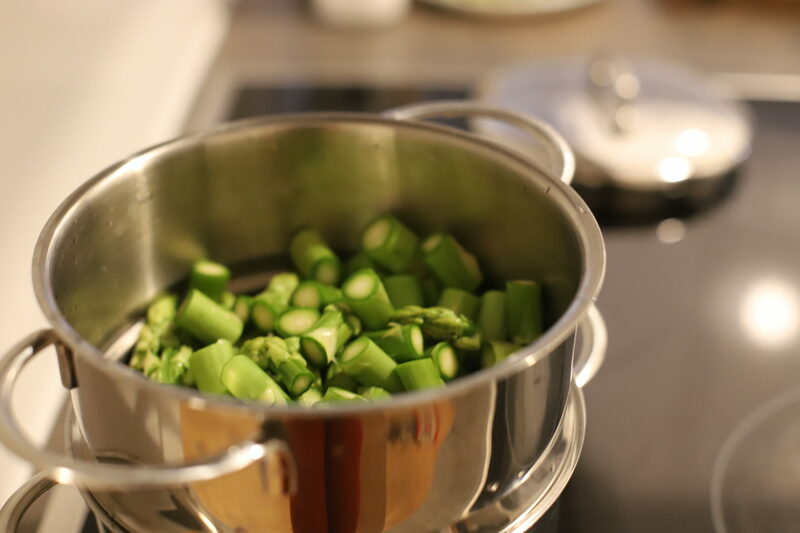 Check the asparagus and when it's soft and tender add it to the sauce. Taste the sauce and add some salt and pepper if necessary. Cook the sauce until the pasta is ready. When the pasta is ready, drain the pasta and add it to the sauce. Stir until everything is combined. Serve immediately. White wine, garlic and dried tomatoes sounds like a good combination!Do you have a recipe for that version you can link to?